Citrus Based Dietary Fibers Market size is estimated to surpass USD 1.5 billion by 2024; according to a new research report by Global Market Insights, Inc.
Strong outlook with versatile applications including bakery, dairy, meat, beverages, food preparations, fruit preserves and other applications are among key factors driving the citrus based dietary fibers market growth. Effective hydrocolloidal properties including high water holding capabilities has enhanced the product scope in food applications. 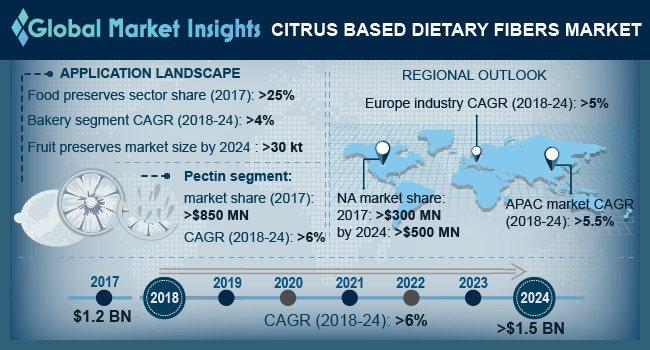 Shifting focus towards health and fitness coupled with rising nutritious food demand will propel the citrus based dietary fibers market growth. Rising number of disease incidences influencing natural sourced food demand will support industry expansion. Rapid expansion in the functional food industry owing to the vitamins & minerals deficiency in daily diet will propel the industry growth. High nutritional source including flavonoids, carotene, and polyphenols provides a positive outlook for the product demand. Increasing product demand in pharmaceutical applications due to improved fat metabolism, anti-allergen property and prevention against breast cancers will enhance the product penetration. Regulatory policies and guidelines provided by government bodies globally will fuel the industry expansion. For instance, as per the American Dietary Guidelines, 2015-2020, daily recommended dietary fibers intake is 14g/1,000 kcal. However, increasing raw material costs with changing agricultural trends may hamper the product price trend. Pectin market will witness CAGR at over 6% in terms of revenue up to 2024. Pectin is widely used as a thickening & gelling agent and stabilizer in numerous food products including cakes, fruit-yogurts, desserts and marmalades. Reduced cooking time, increased shelf life and improvement in texture & color are among key properties driving the citrus based pectin demand. Fruit preserves market is projected to surpass 30 kilo tons by 2024. Inclination towards processed food among consumers due to changing lifestyles will support the industry demand. Strong outlook in bakery jams, high sugar as well as low sugar jams will propel the citrus based dietary fibers market size. Thickeners lead the citrus based dietary fibers market accounting for over 35% of the industry share in 2017. Rising demand for thickening agents in food as well as pharmaceutical applications will propel the industry growth. Food grade citrus based dietary fibers market was valued over USD 950 million in 2017. High water retaining and binding capacity along with effective thickening properties have stimulated the product scope in bakery and meat applications. Increasing product adoption in mayonnaise, ketchup and processed cheese applications will drive the industry growth. Asia Pacific citrus based dietary fibers market will witness CAGR over 5.5% from 2018 to 2024. Surging consumer spending in the premium health products coupled with the rising demand for numerous nutraceutical variants will proliferate the regional industry growth. Lemons are the dominating sources for the citrus based dietary fibers production. Abundant lemon production mainly in India & China supports the industry demand. North America citrus based dietary fibers market accounted over USD 300 million in 2017. Potential processed food products market including acidified milk drinks, fruit beverages, yogurts and confectionery provides lucrative opportunities for the product demand. Surging prevalence of obesity and cardiovascular diseases coupled with soaring diabetes among youth & adults will augment the regional demand. Fiberstar, Ceamsa, CP Kelco, Cargill, Yantai Andre Pectin and Herbstreith & Fox are among major citrus based dietary fibers manufacturers. Global industry share is moderately fragmented with presence of multinational corporations and regional players. The manufacturers are involved in production capacity expansions, new product launches and mergers & acquisitions to gain competitive share. For instance, in December 2015, CP Kelco completed its pectin plant expansion in Brazil and planned for capacity expansions in Europe.